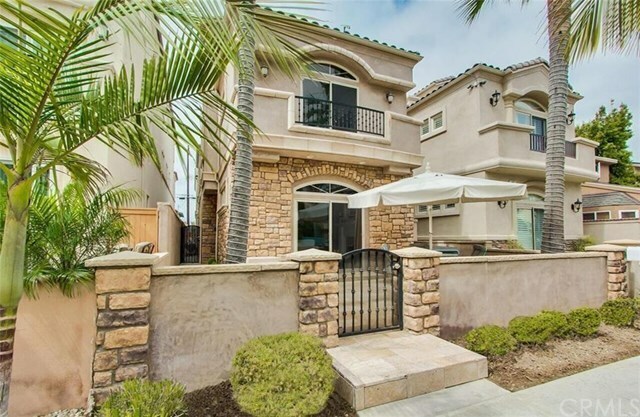 Priced below recent appraisal...Luxurious Resort-Style Living at it's Finest in this Newer-Built (2010) Downtown Huntington Beach Masterpiece! This 4 Bedrm, 3.5 Bath, 2779 Sq Ft Beach-Close Home is Beautifully Appointed Throughout Using all the Finest Materials & Craftsmanship, Including: Travertine Flooring, Crown Molding, Granite Counters, Arched Passages, Custom Window & Door Casings, Top-of-the-Line Stainless Appliances, Recessed Lighting, Surround Sound, Ceiling Fans, Designer Light Fixtures, Wrought Iron Railings, Custom Entry Door w/Glass & Wrought Iron, Raised Panel Doors, Solid Wood Maple Cabinetry & Custom Built-Ins, Stacked Stone Exterior, Professional Landscaping, & More! Most Popular Open Floorplan w/Volume Ceilings, that Includes Elegant Formal Living Rm w/Fireplace & Built-In Media Cabinetry, Large Formal Dining Rm, Spacious Family Rm/Breakfast Rm Combo that's Open to the Chef's Dream Granite & Tumbled Marble Kitchen w/Center Island (w/Seating), Walk-In Pantry w/Etched Glass Door, Viking Appliances & Kitchenaid Built-In Refrigerator. The 2nd Level has 3 Bds, 2 Baths, Bonus/Media Room, & Loft/Hall w/Built-In Desk. The 3rd Floor Boasts a 2nd Master Suite w/Cathedral Ceiling & Private Deck. Main Master Features Fireplace Flanked by 2 Custom Built-In Dressers w/Mirrors, Juliette Balcony, Organized Walk-In Closet, & Spa-Style Tumbled Marble Bathroom w/Spa Tub, Separate Shower w/Clear Glass Enclosure, & Dual Sinks. Large Front Patio & Private Back Patio.